Welcome to the JustRite Christmas Blog Hop, I'm so glad you stopped by, the JustRite Design Team has some talented designers joining us for today's Christmas Blog Hop. 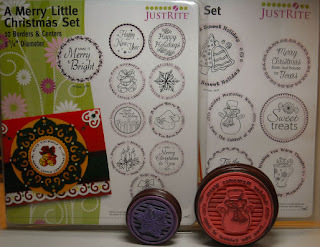 I used images from JustRite's A Merry Little Christmas and Something Sweet Set to create my Bind It All Flip Book. 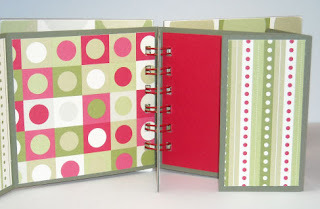 The Flip Book is a great place to add your Holiday Photos and some journaling, or wonderful to give as a gift. After assembling my Flip Book (click photo to enlarge) using some Retired Stampin' Up! DSP, I stamped the snowflakes from A Merry Little Christmas Set using the 1-5/8" Wooden Stamper and the Vanilla Double Technique on Red card stock, layered on a Garden Green panel then on the cover of my BIA Book. The sentiment from Something Sweet is stamped in Black using the 2-3/8" Wooden Stamper on Garden Green card stock, cut with the Big Shot and Spellbinders Circle Dies, then layered on a Vanilla Spellbinders Scallop. The cute snowman image is also from the Something Sweet Set, stamped in Black on Watercolor paper, but with the Big Shot and Spellbinders Circle Dies. The image is lightly colored with an Aquapainter and ink pads. I used Spica Glitter pens to add a big of bling to the holly, nose, gloves, eyes and mouth. I Paper Pieced the scarf with a piece of Stampin' Up! Ski Slope DSP. Here's what the book looks like when opened. What a fantastic idea Lisa, love this gorgeous book!!! I love the flip book! Really cute! Love this flip book! Sweet colours and great idea! Your book is just so sweet! Great job! What a fun little flip book! Love that patterned paper! As usual another great project. I really like that book. That is SO cute!! What a wonderful idea!!!! Darling book, Lisa -- love it! This is such a great book, Lisa! Love the flip feature! Hope you are having a wonderful day! Great project! The sentiment is perfect for a flip book! I love the flip book! Darling memory book, Lisa! So cute and a special gift. Your cover tag is so sweet! 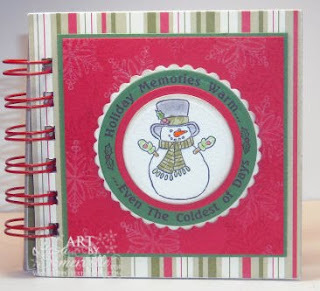 What a darling book, Lisa -- love this idea and your sweet snowman! Lisa, you always make the neatest things! This is so sweet - love the colors! Girl you are just everywhere!!! Love your little book! What a wonderful book, Lisa! I love your flip book. You did a great job with it! Great book. Could be used for so many things. Great job. The book is fabulous! Great idea. Too cute!! Love the festive colors and paper too! The book you put together looks really good. It has a funky look to it that I like and am not surprised at all so many other commenters liked it. Will have to stop back by to see more of your work in the future. WOW!! beatiful book...I love the colors! !